Just a bit of Liberalverse. The angry/overwrought/depressing things c!Stephen says to himself are things you wish l!Stephen would take into account, and vice versa. Aw, so cute. Nicely done! 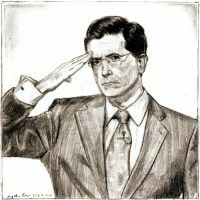 It'd be interesting to look at worlds where Colbert didn't have bad parents. What aspects of his character would change and what would stay the same? poor L!Stephen. He needs a hug. And children. poor C!Stephen too... although I feel less sympathy for him. They both need hugs. And a few tips on how to raise children well. Makes you wonder if L!Stephen can resist those commercials that feed a child a day... In his bleeding-heart liberalism he must be positively dying inside. Oh, man, he sponsors a bunch of children. And regularly buys cows for villages in Africa. And frequently bothers his friends over whether they've done the same yet. Jon occasionally has to remind him to slow down, or else he'll burn out and retreat to become an angry hermit off in some forest somewhere. Jon must want kids... or does Jon have no say in the matter? Depends on what version of them you're writing. Wifeless AU for Jon? Story where Jon and l!Stephen aren't together? AU where they got together in their twenties and went on from there? RL!Jon had kids late, and has said he wishes he'd had them earlier. So if it's a version of Jon who doesn't have kids, he probably wouldn't push Stephen to have them. But if it's a version of Jon who does have kids, as soon as he figured out that Stephen secretly wanted them too, he would be encouraging. Jon Stewart wants kids... and there's no such thing as a plotline where's there's no JonxStephen. It's just not right... or anything I would like. So..regular Stephen doesn't yell at his kids? < someday? C!Stephen has kids, yells at them excessively, and expects them to toughen up and take it. L!Stephen thinks that any kind of discipline or limitation he could impose, even the "setting healthy boundaries" kind, would be excessive, which is a big reason why he hasn't had any.